".. I clicked on a normal-looking link to a BlogSpot blog. Instead of taking me to the blog it took me to a website that looks 100% identical to a YouTube page. Where a video would normally start playing it instead said "Video ActiveX Error" and a DMG entitled "1234" that was approximately 750kb automatically downloaded to my computer." Question: How did you get that link ? TrojanDNSChanger for Mac is getting in the wild and it is desperately trying to get into users by using channels with wide or massive audience such as social networks. This incident has been around for a week where a malicious link will redirect users to a Fake YouTube website and without user intervention it automatically download a DMG file, which is the Trojan DNSChanger for Mac. **Take Note: The installer filename changes everyday. 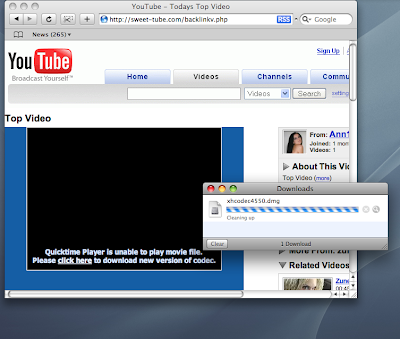 The installer name usually displays: "MacVideo" or "Porn4Mac". Although this trojan requires manual installation, it is still possible that some Mac users will get hooked to this trick. Always be on the look-out for this type of dodgy websites.